Amenities satellite 42' plasma TVs, DVD player and sound system, air-conditioned bedrooms, ceiling fans throughout, equipped kitchen, complimentary WiFi broadband internet. 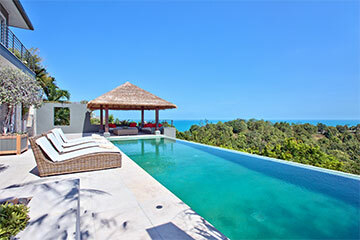 Baan Kohia is a stylish hillside home, overlooking Chaweng bay, with stunning sea and sunrise views. Designed in contemporary Balinese-Australian tropical style, and generously proportioned, the villa offers relaxed luxury in a seamless indoor-outdoor living space. Spacious and comfortable, Baan Kohia features numerous outdoor lounging options, and is conveniently located within easy reach of Chaweng beach and the island's main attractions. The villa is built on three levels that cascade down the sea-facing hillside. The upper level consists of 3 en-suite double bedrooms, all with A/C, ceiling fan, halogen lighting, King-size beds, built-in wardrobes with personal safe and mini-bar, and access onto a large balcony through folding glass doors. The balcony is furnished with comfortable sofas, facing the sea view. The en-suite bathrooms all feature oversized rain showers, glass sinks, and private walled gardens, 2 of which have oval terrazzo tubs. The slightly larger master bedroom also features a large plasma screen TV with satellite receiver, DVD, CD, and surround sound that is piped into the bathroom. Elegant sandstone stairways connect the 3 floors. The second level houses a 4th en-suite double bedroom, separated by a sandstone floored patio from the spacious open-plan living room. The patio is furnished with an al-fresco lounge set, and features an ornamental pond with stepping stones. The living room includes a kitchen with breakfast bar, a dining table seating 8 in comfort, and a lounge area with sofas and armchairs arranged around a coffee table and 42" satellite TV/DVD, with surround sound speakers. The living room is beautifully lit, with dimmer-controlled halogen lighting, and concealed ceiling lights. Sliding glass walls open onto a surrounding balcony, which overlooks the swimming pool and sea views beyond. The gentle sea breezes and array of ceiling fans provide ample ventilation. On the third level, the 12 metre infinity edge swimming pool sits on the view, with a large, thatch-roofed sala pavilion at one end, furnished with sofas. The pool is surrounded by a sandstone deck, which extends into a shaded living area with a large sofa and dining set. An experienced and friendly team of staff is at your disposal to cater to your every whim. The main tourist area of Chaweng, 2 minutes drive away, offers a 5 km white powder sand beach, and a plethora of excellent restaurants, bars, nightlife, shopping, and spas. 40% discount for stays until 15 April. Applies to all occupancy rates, and cannot be used in conjunction with other promotions.